Explore the bright lights, neon signs and diverse crowds that are Times Square! Download the newest version (2.1) which allows you to manually control the camera right at your fingertips! Also features an updated camera list and graphics so sharp you will think you are actually at the location! 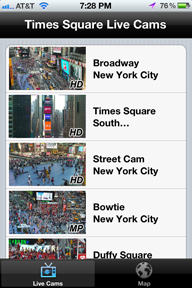 EarthCam presents one-of-a-kind views of Times Square live on your iPhone or iPod. Catch all the excitement taking place at the world famous destination. People watch and be amazed by the dazzling lights of the "Crossroads of the World" as live cameras provide views looking up, down, and across 7th Avenue and Broadway. Also, check out holiday celebrations and events such as New Year's Eve in Times Square, the Thanksgiving Day Parade, Easter Parade and more.